Richard Fankhanel and Kent Greves. Photo by Riverwood Photography. 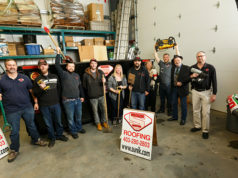 When Kent Greves’ father, Gary Greves, started Diamond Fireplace & Stone in 1983, the company offered customers a small selection of half a dozen wood burning fireplaces. A lot has changed in 35 years. While the business continues to focus on customer satisfaction and quality products as it did in the beginning, today’s Diamond Fireplace boasts an impressive selection of only the best brands in the industry. They are well on their way to achieving that. Designers, contractors, new home builders and retail customers all know that Diamond has the expertise, experience and product lines that translate into the perfect fireplace or stone finishing for their space. 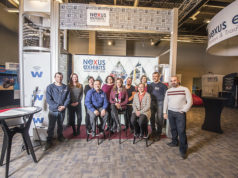 Over the years, the company has evolved and expanded from wood burning units to include gas and electric fireplaces and accessories, barbeques, HVAC, antique and retro kitchen appliances, and outdoor firepits and stoves. It is also a leading supplier of quality manufactured stone with a wide range of colours and styles for home exteriors, interior accents and fireplace finishings. Diamond’s professionals both provide and install the stone, and there is sure to be something for every taste and style in the catalog. From castle to fieldstone, stack to ledge stone, rubble to river rock, Centurion Stone can accommodate every design need of Diamond’s customers. Whether clients are redesigning facades or adding rock to a fireplace feature, Greves is proud to be the one-stop shop. “Our showroom is pretty unmatched in the city for what we can display in fireplaces and our stone products,” he says. The 5,000+ square foot showroom is the jewel of the recent move to the 15 Street northeast location. After more than 20 years in the previous storefront, Diamond relocated and has the space and layout to do its incredible products justice. The showroom is a world of possibilities featuring more than 70 working fireplace displays and extensive stone samples. Clients can walk through the displays and find a style that fits their tastes, and they are encouraged to return often. Diamond is always renovating the displays to ensure the newest and most popular products are featured in the showroom. Diamond has the best products from the top manufacturers, many of which are Canadian. With high-end fireplaces from Town & Country Luxury Fireplaces that offer gorgeous clean designs, the artful and innovative designs of Montigo fireplaces, the stylish and modern wood burning fireplaces manufactured by Renaissance Fireplaces, and top-of-the-line Napoleon barbeques and fireplaces, Diamond has it all. The latest trends can be seen throughout the showroom, most notably in the lines of linear fireplaces. These long, rectangular electric fireplaces are beautiful art pieces as much as they are design elements. Clients can change the colour of the flames flickering in these built-in or wall-mounted pieces with the click of a remote control. While they don’t throw off the heat of a wood or gas fireplace, the linear designs function more as an art installation that doubles as a space heater, giving off around 5,000 BTUs. These units are perfect additions to condos or small spaces and continue to be a top seller for Diamond and a growing trend in the market. Diamond also offers modern wood fireplaces that are more beautiful, efficient, and airtight than those Kent’s father could have ever imagined when he started the company decades ago. For those preferring convenience over tradition, Diamond also carries gas inserts to convert fireplaces from wood burning to gas. With the convenience of heat with the flick of a switch, along with the vast selection of beautiful units available, gas fireplaces continue to be very popular with Calgary customers. The modern designs are aesthetic as well as warm, and the fans are quiet, so they can spread heat without interrupting the cozy, comforting atmosphere. Regardless of the style or fuel source, Diamond ensures its products are safe. Many of the high-end fireplaces the company carries are designed with extra panes of specialty glass or safety screens to give parents and pet owners peace of mind that the fireplace is safe to touch. Diamond Fireplaces & Stone cares about clients and goes above and beyond to get them exactly what they want and need. “Another niche market that we offer is custom fireplaces. We’ve done custom fireplaces in malls and hotels as well as individual customer designs,” says Fankhanel. It all comes down to ensuring customers are happy, which means carrying on a relationship once the sale and installation is complete. Diamond services the products it sells; knowledgeable technicians are available to do maintenance and repairs to ensure products are in top shape. Technicians check to make sure the valves, thermocouple, and switches are in peak order and that everything is clean and well-kept, so clients are ready to enjoy their fireplace when the weather turns. But with Diamond’s products, clients don’t have to wait until winter. There is a unit for every room, even if that room doesn’t have walls. With an impressive selection of gas and propane fire pits and tables, wood stoves and outdoor fireplaces, Diamond helps clients create a fantastic and comfortable outdoor living space. The few Napoleon backyard barbeques and accessories featured in the showroom are a mere sample of what Diamond carries. The company can bring in any Napoleon product, so clients can achieve their perfect backyard paradise. 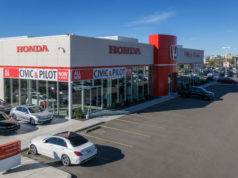 Diamond has been serving the needs of Calgary clients since 1983 and with the new location and spectacular showroom of products, it is determined to continue that tradition. While the market has changed in 35 years, Diamond’s dedication to excellence and customer service never will. 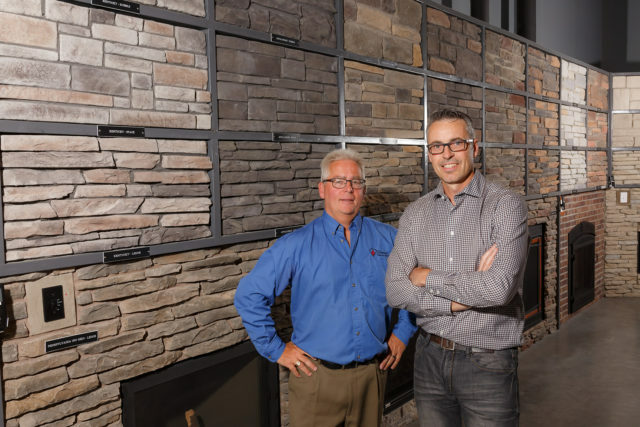 That’s why, inside and out, Calgary designers, architects, and retail customers know where to find the best fireplaces and manufactured stone products in the city—for its many repeat customers, Diamond Fireplace & Stone is the only place in town.